"Ed butters his bread by doing voice over work." You have to scroll down a bit, but its there. I think we have our very first Ed Helms interview to post. Ed, Stephen, Rob, and Mo did an interview recently with the Onion "AV Club", and if you click the aforementioned link; you can read it. This man has a mother in law? FORT WORTH - Mark Vaughn said so himself. Sliding down his mother-in-law's chimney Tuesday morning wasn't exactly a hot idea. It was "Stuuuuuupid!" the soot-covered man cracked to reporters after firefighters worked for more than an hour to free him from the fireplace. "She was telling me not to do it. But it looked like I could get in, you know what I'm saying." Most people might agree that, unless you're Santa, you just can't slide down a chimney without getting stuck. But Vaughn - a 35-year-old entertainer-DJ-singer-wanna-be-actor - marches to the beat of a different drummer. So when his mother-in-law locked her keys in her house just before 11 a.m., he decided to tackle the problem feet first. "I slid all the way down, but the angle wasn't right," Vaughn said. "I couldn't move. I was trying to work it out. But I worked myself into getting stuck." Vaughn's mother-in-law, who had wanted to call a locksmith to begin with, dialed 911. Moments later, seven Fire Department units, including the technical rescue team, came screaming up to the house in the 4800 block of Westridge Avenue. Paramedics brought out a stretcher in preparation for Vaughn's rescue. A mob of television reporters flocked to the scene, angling for space behind yellow tape as neighbors griped at them to stay off their yards. The obviously embarrassed mother-in-law kept her distance, making it very clear to fire officials that she did not want to hear her name or see her face on the news. Next-door neighbor David Poindexter, 83, dressed in red plaid golf pants and a bolo tie, hobbled out of his house on a cane to see what all the fuss was about. "I was in my house and my wife came to the door and said there were firetrucks outside," said Poindexter, who, every now and then, had to be gently steered out of the way by firefighters. "My Lord, half of the Fire Department was out front. They just moved in a couple or three days ago. "I came out and discovered there was a gentlemen caught in the chimney." Like so many others, Poindexter watched wide-eyed as fire officials cut, drilled and dug their way through the rock and brick fireplace. Finally, a white and blue tennis shoe emerged. Not long after, firefighters gingerly helped Vaughn, sporting a beard, silver earrings in both ears and dressed in all black, out of the fireplace and into the yard, where his mother-in-law was waiting. After a brief yelling match between Vaughn and his mother-in-law, in which Vaughn could be heard yelling, "Just be cool about it!" all appeared well again - except, of course, for the large gaping hole in the chimney. Vaughn refused medical treatment and spent the next several minutes shaking firefighters' hands. "Firemen rock!" Vaughn later told reporters, adding that he wasn't even upset that they had nicked his finger a bit with a drill. "They were here to save my life." He described his new-found freedom like, "Winning the lottery, man!" but he acknowledged that he had learned a lesson or two from his adventure. "Listen to your mother-in-law. Don't climb down chimneys. And I probably need to lose weight." It's an all new season of Premium Blend with Wanda Sykes, featuring Dan Gabriel, Ed Helms, B. Donohue and Guy Torry. Added some stuff this week. And screen captures from the January "Mark Your Calendar". This Page CAN Be Found On AOL Hometown, darn it! *Ed will get a new pair of glasses. 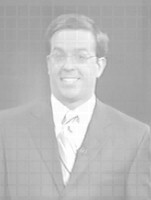 Maybe fashioned like the early plastic frames Mo Rocca wore in 2000. Since I'm under 21, and I don't have a life, I decided to work on the site tonight. I added some more synoposis, a new section called whatnot, and I put the Confessions of a correspondent on the site because I know comedy central is going to take it off of the daily show site in a couple of months.